Peter writes the following from his personal perspective as an author, lecturer, and an implementer of various computing projects over a period of more than 35 years. His comments are not an official position or an indication of future offerings from salesforce.com inc. This is the second article in Peter’s two-part series on blockchain. By Peter Coffee, Peter Coffee is VP for Strategic Research at Salesforce. The connection-dependent models discussed in my first blockchain article published last week, enjoy what we might call an “atmosphere of bandwidth.” We might expect to see greatly different behavior on a planet where one can go from one building to another quite easily, compared to an airless rock where a person needs to put on a space suit to go outdoors – to put on an envelope of air, as dialing up a modem was once needed to create a temporary and clumsy envelope of data. In 1996, an anticipated explosion of connection in the world was proposed as the decisive “key abundance” of the next economic area by George Gilder. Do the numbers for global bandwidth growth, since then, validate his vision? In gross terms, global bandwidth has been growing at a compound rate on the order of 44 percent per year: not as quickly as we’ve been squeezing more transistors onto our microchips, but still a recognizably hockey-stick kind of curve. If we talk about the data rates available to individuals, in our homes, we’re talking about a progression from the first 300 bps direct-connect modems in 1977 to 30 Mbit/second fiber service in 2016 – a somewhat less impressive compound growth rate of 34 percent per year. 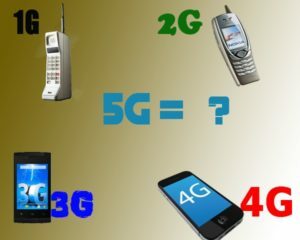 It might be more important, though, to ask what kind of connectivity people can expect when they’re out and about on their mobile devices, since mobile became the majority mode for global Internet use around the end of 2016: the evolution from early-‘90s 2G wireless (about 100 kbit/sec.) to present-day LTE-Advanced (1 Gbps or more) represents a more vigorous improvement of 45 percent per year, in line with overall global capacity expansion. If anywhere, anytime access to mobile connection is a prerequisite to broad adoption of shared-truth models, there is plenty of basis for saying that this is well under way. It’s far from being the universal human empowerment that’s held up as a goal by the Alliance for Affordable Internet, with its standard of 1 Gbyte of mobile data for less than 2 percent of average monthly income: “In some countries, the cost remains over 20 percent of average monthly income,” wrote Web inventor Sir Tim Berners-Lee in his open letter to the world on the 29th birthday of the Web this month. But progress in this direction is clear, with wireless bandwidth increasingly considered a public amenity. A generous atmosphere of connection, and a luxuriant growth of mobile activity and habits of constant engagement – almost certainly taking turns as cause and effect – are key to the second of two blockchain-related shifts predicted by the World Economic Forum in the report, “Governments and the Blockchain.” As with other such developments, the WEF offers a specific statement of what that tipping point might be: “Tax collected for the first time by a government via a blockchain,” with 73 percent of the WEF’s survey sample expecting this to happen no later than 2025. Plot spoiler: already, as of late 2017, the government of China has stated that “social taxation and electronic invoice issuance” on blockchain will be undertaken as part of a larger initiative, a Chinese “government affairs chain” GACHAIN. Miaocai Network, a state-owned enterprise, will apparently be the implementing entity for a system that takes direct aim at China’s “increasing trend of taxpayers not complying with their tax obligations” (in the words of an academic study from Hong Kong). It helps when governments feel more than mere technology-push incentives. It also helps when a government enjoys a certain degree of freedom to make things happen quickly. “I want to add four lanes of superhighway from Nantong to Suzhow,” says the Chinese vice minister in a Doonesbury comic strip from January of this year; literally minutes later, her assistant reports them done. It’s only funny because it contains large grains of truth. China won’t surprise anyone if it does this first. Given these incentives, and the evident feasibility of doing what governments clearly would benefit from doing, the WEF’s 2025 projected date for distributed ledgers as a tax collection tool seems conservative. It is, perhaps, an almost unsporting running up of the score to conclude with a salvo of “the future is already here” news items. However, we’re seeing a host of large companies entering this space. FedEx is developing a set of industry standards for blockchain use; American Express, which launched instant blockchain payments for US business users sending money to select UK businesses; and the United States General Services Administration which is in the early stages of developing a blockchain prototype for IT procurement operations. Examples such as these make it clear that this is not just about fringe applications or pre-revenue startup initiatives. Sporting or not, though, it’s just too good a chance to offer a new spin on William Gibson’s famous (and even accurately quoted) comment that “The future is already here – it’s just not very evenly distributed.” The future of many things, based on blockchain and the larger family of connection-intensive and cooperative data models, is here – because it is distributed.